Leyton Orient boss Ian Hendon hailed “a team performance” from his side as his league reign started with a win at home to Barnet yesterday. 2 goals in a minute from Jay Simpson and summer signing Paul McCallum helped Orient on their way to victory. It was not all plain sailing for the O’s who were under pressure for spells in the first half but a change of system at half time helped Hendon’s side to the win. Hendon signed as manager in the summer after a dismal season for the club last season, looking to bring some much need stability to the football club. It was a perfect game to start the season having played for both clubs during his footballing career. The former West Ham coach continued as much of pre-season with a 4-4-2 diamond, offering starts to 5 summer signings. Sean Clohessy and Fraser Shaw started at full back with Connor Essam partnering new captain Mathieu Baudry at center half. 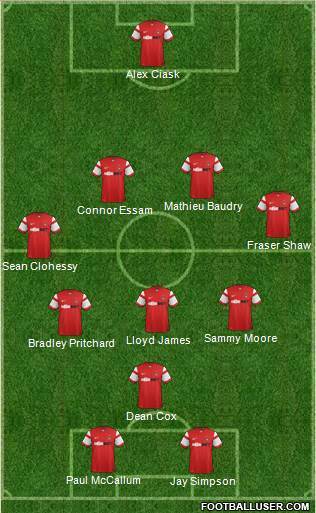 Sammy Moore started alongside Bradley Pritchard as the “2″ in the diamond while Paul McCallum started in attack. Bees manager Martin Allen named only 2 debutantes in his opening day side with Gavin Hoyte slotting in at right back and Bira Dembele starting at center half. Prolific scorers at non-league level in Michael Gash and John Akinde started in attack for the visitors. After all of the attention on Hendon pre-match, it was the away side who looked right up for the occasion. The O’s struggled at home last season were finding it hard to play the open football the fans had seen in pre-season. Barnet were looking to find Akinde and Gash in the channels with both having a physical presence. Winger Andy Yiadom was nearly allowed an unchallenged run into the penalty area but a fine tackle from Lloyd James stopped him in his tracks. It was then the former Southampton trainee who set up the first real chance of the game. His through ball found Paul McCallum who had beaten the Barnet offside trap but his curling shot went wide of the mark. A guilt edge chance with the former Hammer brimming with confidence after goals in pre-season. The home side were finding it difficult to play especially trying to handle John Akinde who was providing all sorts of problem to Baudry. The striker was holding the ball up for the visitors to much effect bringing his team mates into play. It was the former Bristol City striker who created the best chance for Barnet after 15 minutes. A battling run down the left flank saw him enter the penalty area crossing to his strike partner Michael Gash. But his 8 yard side footed effort into the half empty goal was screwed wide. A major chance in terms of the game with the Bees knowing that at this level you have to score when you are on top. With the home side utilizing the midfield diamond, at times it appeared they were left short in center areas which allowed the Bees to break. Sean Clohessy and Fraser Shaw were tasked with providing width for the O’s and it almost paid off on 21 minutes with Clohessy crossing to Simpson who curled over. Akinde was a real menace up front for the visitors and created a chance of his own after 24 minutes. A neat run in the right channel saw his shot saved by Alex Ciask in goal, Akinde followed up crossing to Curtis Weston who headed over. Barnet were well on top with Orient at times looking adrift of ideas but credit has to go to Martin Allen who had stifled Orient going forward. Bradley Pritchard was a bright spark for the O’s, after being shoved out to play right midfield last season, the former Charlton man was reveling in his central role. His energy and work rate nearly saw Orient take a lead into the break with a brilliant recovering slide tackle putting Clohessy away down the right. A neat passing move followed with Pritchard crossing but too close to Graham Stack in the Barnet goal. With the midfield diamond failing to work in the first half, Hendon changed tack in the second with what seemed a 4-3-1-2 system with Cox given a free role to roam in attack. The change appeared to have the desired effect with Simpson and McCallum going close on 50 minutes for the hosts. Orient seemed to relish the task handed to them by Hendon with the midfielders given more license to create space and change positions. The O’s were in the ascendancy with play being switched from left to right allowing Clohessy and Shaw to advance into attacking areas. First McCallum headed down to Clohessy but the former U volleyed over and just a minute later Shaw crossed for Pritchard but his header was easily saved by Stack. With Orient on the front foot, the Bees were limited to possession and attacks on the home goal with Akinde’s involvement drifting from the game. Clohessy again provided width on 65 but his cross evaded everyone in the box as Orient’s search for the opener continued. The O’s bench were urging their side forward nearly taking the lead with the best move of the match. Brilliant play down the right saw Cox create space, his through ball played in Simpson who held off the challenge but his shot when agonizingly past the post. But Orient didn’t have to wait long to break the deadlock, 6 minutes later, Simpson put Orient ahead. 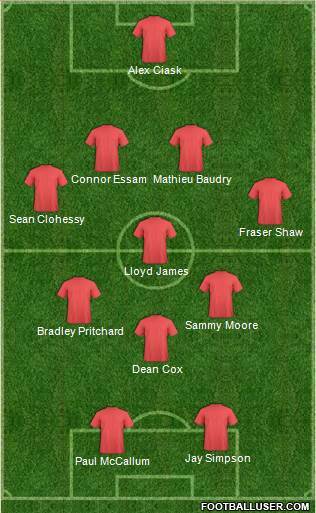 Another move down the right saw Pritchard play in Cox who continued to grow in the game ever more. The diminutive winger crossed for Simpson who volleyed home at the near post. A fine team goal with delight clear to see on every O’s player. The O’s didn’t leave off their, doubling their lead within a minute, Clohessy beat his winger and drove towards the penalty area. His deep cross found McCallum, the ball dropped to the forward who smashed home to double the lead. The O’s were fully in their stride now with all of the team playing their part in the victory with a man of the match display for Bradley Pricthard. I was not the biggest fan of the former Charlton man last season but he has fitted in well under Hendon. The free nature in the midfield seems to suit him and with his best game an Orient shirt, there is definitely more to come from him. Martin Allen will be disappointed his side did not take their chances when on top, something which will need to be worked on in the coming weeks. Akinde provided a physical presence and outlet for the Bees. But he faded towards the end along with a plan B for Barnet. Hendon praised his side in what would be what you call a typical League 2 match. There will be tougher games in he division but if the second half performance is anything to go by; Orient be dangerous when firing on all cylinders.